In addition to cost analysis RiskyProject includes income and revenue analysis with risks and uncertainties. You may perform risk analysis related to both product development and product sales. RiskyProject has separate sets of risks related to income, such as Fixed Income Increase and Relative Income Increase. 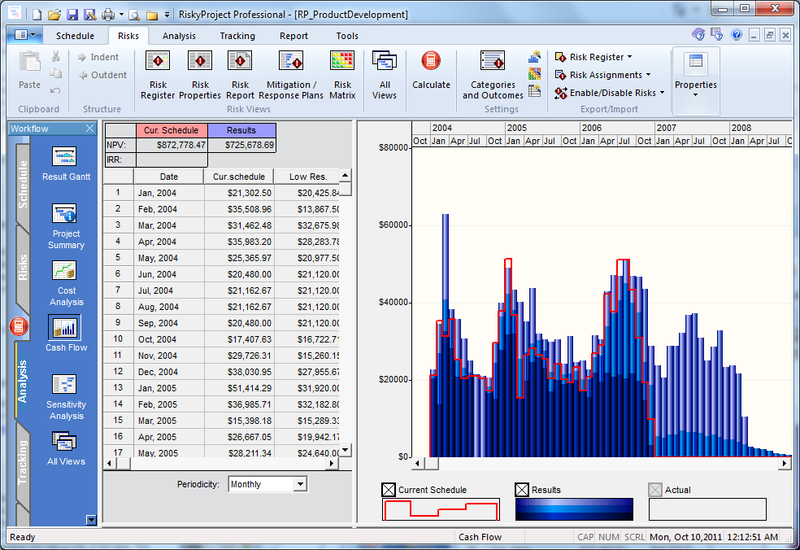 You can view a project cash flow monthly. The cash flow analysis view shows monthly, bi-monthly, quarterly, and yearly cost and income allocation. You can also apply Net Present Value (NPV) discount rates and internal rate of return (IRR). The Cash flow view includes cost and income data in both table and chart format for the current schedule, results of analysis, and actuals.